BATRIBIKE AND OXYGEN ANNOUNCE "HAND BUILT IN BRITAIN"
Batribike and Oxygen have announced that in social media parlance they are "in a relationship". The companies have come together, much as car manufacturers do, to create a "badge engineered" product. The new full suspension MTB style electric bike will be "Hand Built in Britain" at the Batribike facility in Lincolnshire. Batribike and Oxygen are delighted with this unique agreement as it has given them the opportunity to create an electric bike that will be built here in the UK. The Batribike Storm and the Oxygen MTB-X will be available from Spring 2015 through existing dealer networks. The full suspension bikes will come with lots of features including the ability to set your own PIN number on the display/control panel to stop others using the electrics. With MTB styling, 24 gears, lockout forks and disc brakes there is plenty to enjoy. 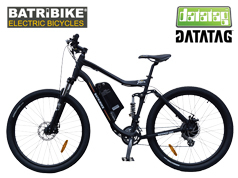 The bikes will be equipped with a 250w rear hub motor and a 36v 10.4 Ah Samsung Lithium battery. As with all bikes leaving the Batribike facility they will be fitted with the Datatag Stealth Pro security system. Having bikes "Hand Built in Britain" is an unprecedented and exciting move for mainstream electric bikes in the UK and one that follows in the footsteps of the old traditions of building bikes in Britain. Sue Coulson of Batribike said "The whole team at Batribike is very excited about this new project, we have been thinking about being able to hand build our electric bikes for a while. At Batribike we are very proud that our bikes are built specifically for the UK market, building bikes here in Lincolnshire underlines this and shows our commitment to the electric bike market in the UK." John Camm of Oxygen said "We are thrilled to be partnering Batribike with this project and proud to be playing a part in bringing bike building back to Britain. Having the bikes hand built in Batribike’s facility will ensure an high level of quality and consistency while ensuring the bike can be delivered at a reasonable price."